Freefly Systems is a company that makes high-end camera gear like $20,000 gimbals and drones for Hollywood movies and shows. Way out of the reach of the normal consumer. Freefly want to change that though, with the release of the Freefly Movi (Not to be confused with the MōVI Pro) a $299 stabilizing gimbal for the iPhone (and only the iPhone) that’ll launch during the first half of 2018. The Movi Smartphone Cinema Robot is designed to only work with iPhones running iOS 11 or later. 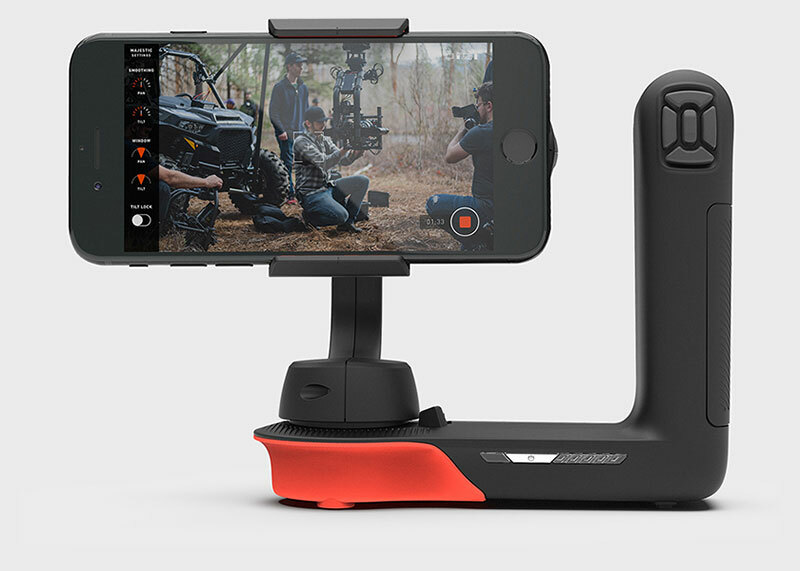 Freefly systems describe the iphone stabilizer gimbal as a “Cinema Robot”. This is a nice branding exercise, rather than anything particulary “robotic”, but maybe it hints at the face that the stabilizer has to work in tandem with the iphone app, rather than independently. Like any gimbal, it holds your camera still while you’re filming and mitigates bumps and shakes. A pair of brushless motors inside the hand-held unit work to keep the phone from bouncing around while recording, and some nifty software keeps the whole system in sync. The mount for your iPhone connects to one side of a flat base; the other side has a grip with a slew of buttons and triggers. 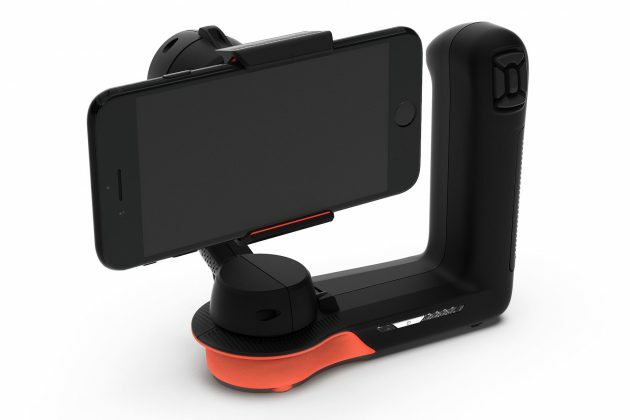 You clip your iPhone into the mount, pair it to the Movi using Bluetooth, then open the Movi app to start shooting. In an interesting departure from the standard gimbal format, Freefly have decided to ditch the single “pole” type handle found on all other smartphone gimbals. Instead the gimbal has a single handle on the right hand side of the camera. 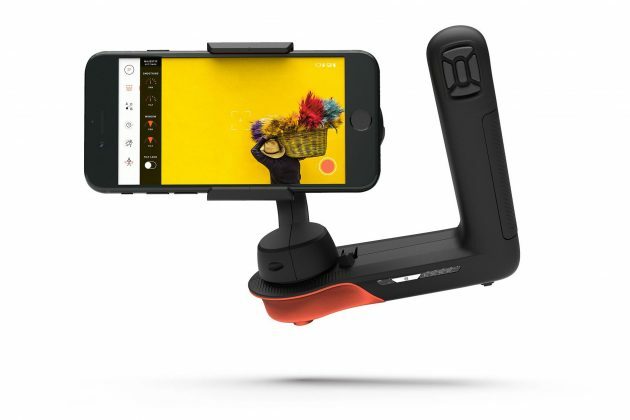 Although, I’m not sure about the ergonomics of this – it’s much easier to support a weight from below that at the side – it sets the Movi apart from other iphone gimbals, like the Zhiyun Smooth-Q, which we have rated as the current best iphone stabilizer. This form-factor does allow you to put the gimbal down on a flat surface, so you can use timelapse modes with out setting up a tripod. Something that’s not possible with pole-type gimbals. 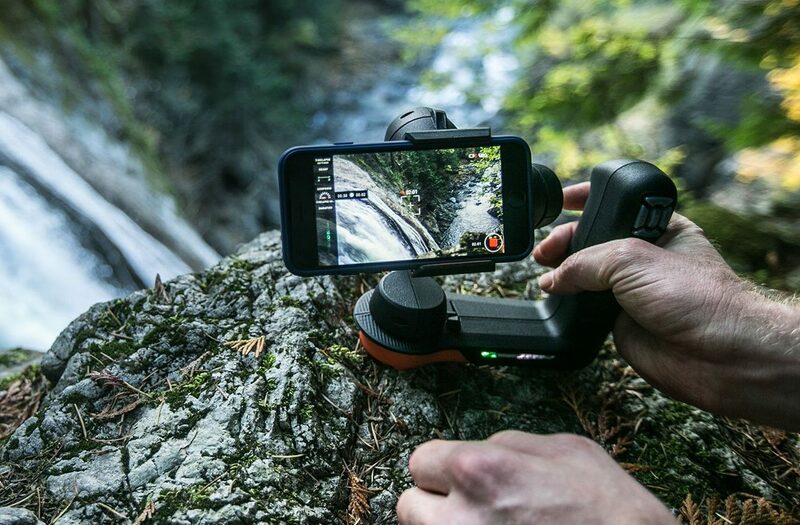 The Movi has 3-axis stabilization and a standard tripod mounting thread to offer increased opportunities for use. It takes a fast-charging lithium-ion battery and weighs 600 grams (excluding the phone). Classic single operator mode. You point Movi, Movi smooths your movements, together you create cinematic footage. This is the basic mode of operaton, similar to how all other smartphone gimbals on the market. Take aim, set your endpoints, define the move’s duration, and pull the trigger to achieve repeatable, automated camera moves. This mode lets you point your smartphone at an A and B point and set with a little trigger on the grip, then it’ll record footage panning from the first point to the second. Give Movi a nice view, define the movement path and duration, and tap go to achieve dynamic Movi-assisted timelapses. In this mode, set the stabilizer on a flat surface, setting the exposure, and telling it how long to record. The gimbal moves the camera slightly between each shot, and you won’t notice it moving while it records. The end result is cinematic timelapse footage. Grab the robot and go. Cover some serious distance and roll timelapse. Movi loves to transcend time and space. This is a unique feature and I’m really excited about the footage this mode produces. As you can see from the video above, Movilapse lets you point the gimbal at a feature in the distance and slows down the movement of the Movi gimbal by 10 times, meaning that when you playback the footage at 10 times speed you are left with with a dream like feeling like you are moving in slow motion while everyone else is speeding by. Keep the shot fixed on your subject as you circle. Getting perfect wrap-around footage is as easy as setting your direction, your speed, and triggering the action. This mode you point your smartphone at an object in the center of a circle and as you move around the target the Freefly Movi keeps the camera pointing in the right direction. This mode allows you to lock-on to a stationary object, and Movi will keep your phone trained on it as much as possible. All these modes are built in to the software running on you iphone, so it seems it would be easy for Freefly to add more functionality with a simple app update. I’m interested to see what they come up with! One of the great features of the newer iphones is the built in optical stabilization, which does a great job of stabilizing footage on its own. Unfortunately the build-in iPhone stabilzation doesn’t play too well with the gimbal stabilization – if you are really shaking the gimbal around the you end up with some weird jittery stabilization artifacts in the final footage. The Movi Smartphone Cinema Robot is priced at $299.00 USD. Launched in December 2017, it is available online now with the first units set to be shipped in March 2018.